Hi there! 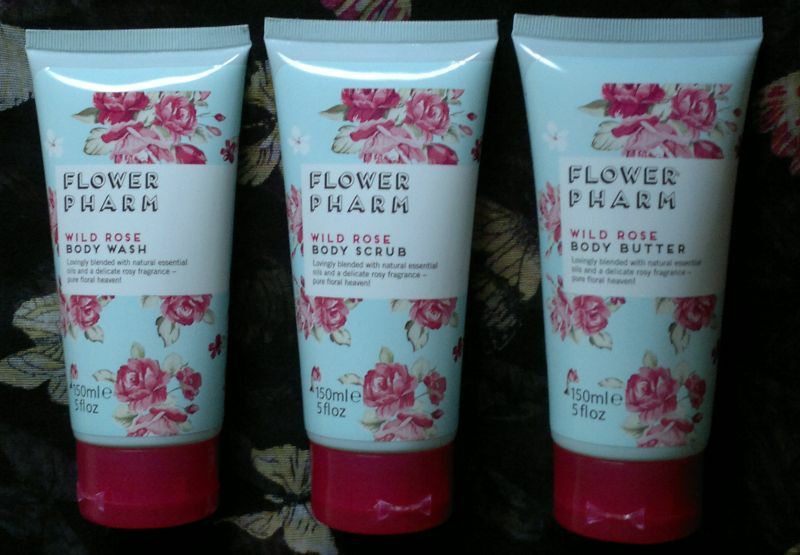 Today’s post is about Flower Pharm’s Wild Rose Body Wash, Body Scrub and Body Butter. It’s been some time since I bought my Flower Pharm Wild Rose gift set (Asda, £5). But when I saw a similar Flower Pharm set (same contents, slightly different packaging) at my local Tesco store the other day (I thought these products were discontinued – ?! ), I knew I should finally try the products that I already have! I have reviewed the body butter (which I have a big tub of) some time ago, and you can read my review here. In summary, this body butter is amazing! It’s rich, but not sticky. It feels great on my skin and it makes my skin feel great. I love it! And instead of mineral oil and synthetic fragrances, it contains coconut oil and real Damascus rose flower water. This body butter is fantastic! The body scrub is very nice and effective. It contains pecan shell powder but it feels like a sea salt scrub. Great stuff! In addition, this body scrub contains sweet almond oil and shea butter – I guess this is why this scrub makes my skin feel so soft and conditioned. The body wash is wonderful. It’s a clear gel that lathers up nicely and cleanses my skin gently. It smells lovely and it doesn’t feel drying at all. Well done, Flower Pharm! If you’re wondering what the fragrance is like… it’s a charmingly old-fashioned and pure rose fragrance. And it doesn’t have that sweaty note that most rose fragrances seem to have nowadays. This is the kind of rose I’d like to smell in all rose-scented products. So yes, I would recommend Flower Pharm’s Wild Rose collection! As Flower Pharm’s products seem to be stocked by the most random stores, you should check if your local supermarket, drugstore or bargain store has them. You won’t be disappointed by Flower Pharm products, I promise! Hi there! 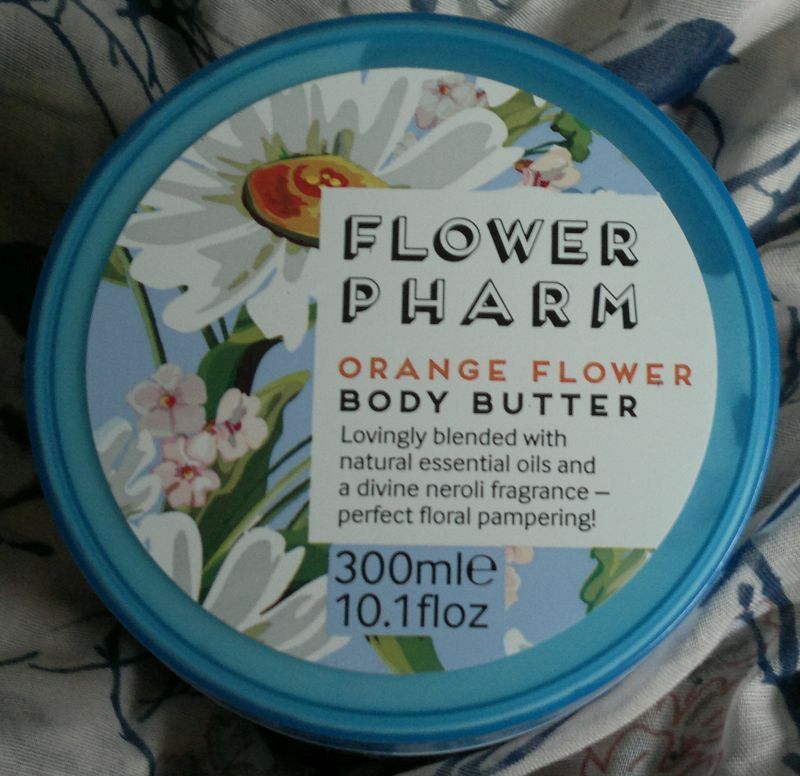 Today’s post is about Flower Pharm’s Orange Flower Body Butter. I got my hands on several tubs when they were 49p each at Superdrug. Yes, I mean it! 49p per 300ml tub! I think this body butter is fantastic. It goes on like a light moisturiser, but it’s really rich and hydrating. Despite this, it’s not sticky at all. Yes, I think the formula is perfect! I also love the fragrance. It’s very authentic, and I’d describe it as a dense and warm Mediterranean orange flower fragrance. It smells very ‘high end’. It’s gorgeous! Looking at the ingredients, this body butter contains coconut oil (it’s the second ingredient listed – after ‘aqua’) and lots of natural extracts (neroli, bitter orange, bergamot, etc). I think this is quite impressive! And I’ve also noticed that Flower Pharm products are made in the UK. Awesome stuff! I would recommend this body butter in an instant. The formula is perfect and the fragrance is simply gorgeous. And if you consider the low price, this body butter is a total steal! I think it’s super easy to rub this body butter into my skin. The formula is lovely, the butter melts into my skin and it’s not too sticky. Well done, Flower Pharm! The fragrance is beautiful and charmingly old-fashioned – just like wild roses! I checked the ingredients and this body butter appears to contain more quality ingredients than other comparable products. So instead of mineral oil and the likes, this body butter contains lots of coconut oil (it’s the second ingredient listed – after water), and it contains real rosa damascena (Damascus rose) flower water! I’ve only used this body butter for a few days, but it seems to have made a difference already. My skin feels very soft and silky. And my semi-permanent eczema patch on my shin isn’t half as itchy as usual. 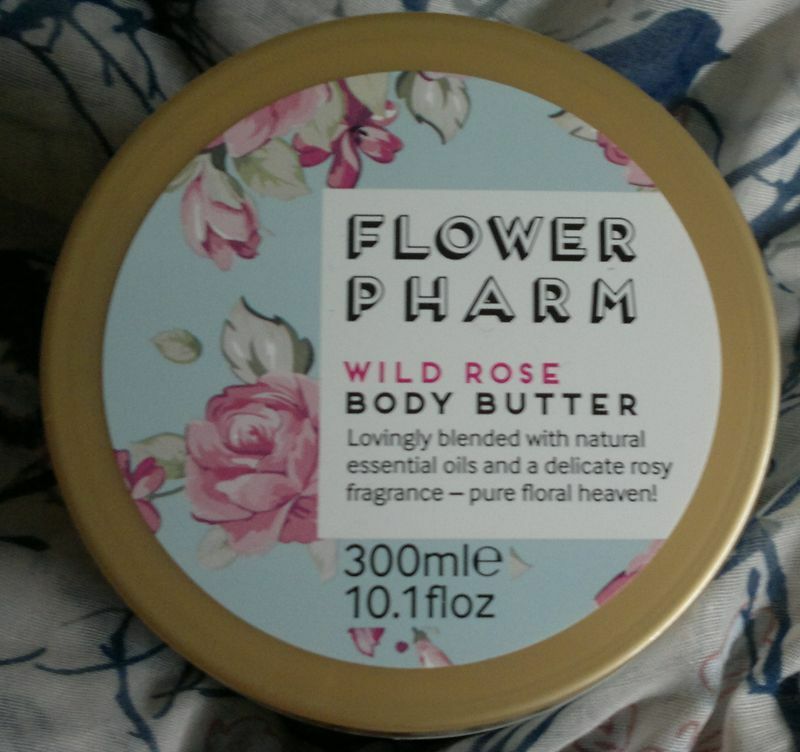 I think Flower Pharm’s Wild Rose Butter is absolutely fantastic, so I can’t understand why the entire line has been discontinued. Seriously, what were they thinking? I’ll definitely buy a few more tubs from my local Home Bargains store this weekend!